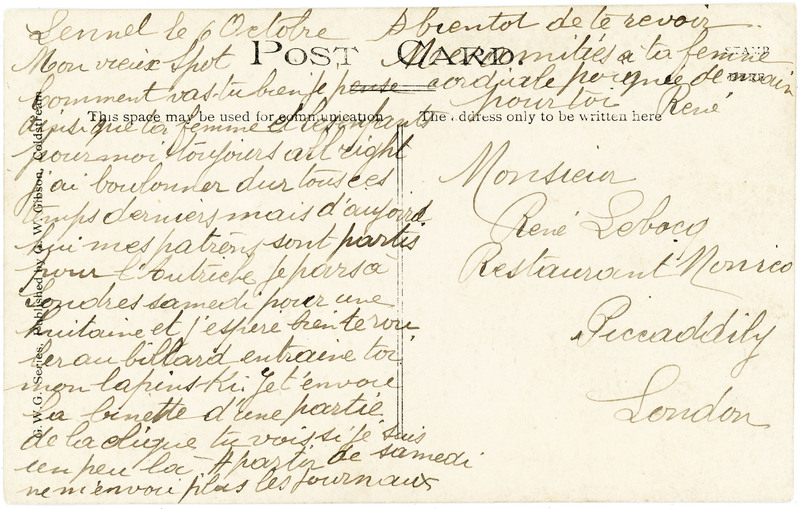 This undated postcard was addressed by a man named René to a friend, also named René, who was probably working at the Café Monico in London. The sender is very likely one of the men in the group above. I turned to a family friend, Stephanie Montgomery, and her daughter Katie for help with reading and understanding the message. The dogs look very relaxed. They were obviously important members of the staff. The Lennel House and Garden were owned by Maj. Walter Waring and his wife, Lady Clémentine Waring (née Hay). Beatrix Potter is known to have spent holidays at the estate. Today the house is used as a Care Home, which I assume is what we’d call a retirement home or nursing home in the USA. You can see two nice photos of the house, taken from the English side of the River Tweed, on this blog post by Cara Lockhart Smith, who lives in Coldstream. During the First World War, Lennel House became an Auxiliary Hospital for wounded officers, one of whom was the poet Siegfried Sassoon. The Australian War Memorial has a photo showing Lady Clémentine on the front steps of the house with a group of British and Australian officers. Caroline Alexander, “The Shock of War,” Smithsonian Magazine, September 2010. How snowy white the attire of the female staff is! And don’t you think the dog on the left is a Pekinese? 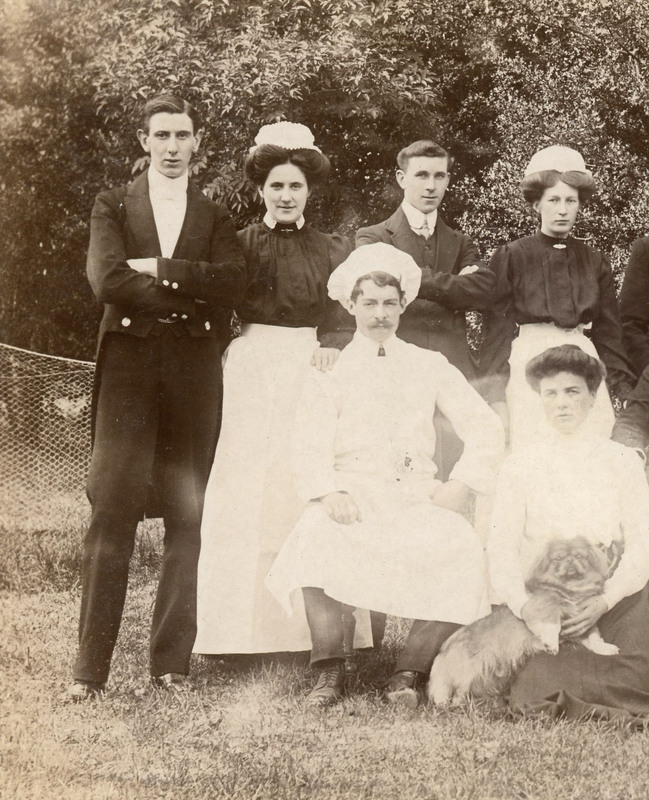 The staff members all seem fairly happy and at ease, though perhaps not as much as the dogs, so it’s nice to imagine that Lennel House was a pleasant place to work. But what a lot of work you have done decoding and translating the message on the back! Perhaps the name of the restaurant should be “Restaurant Monaco”? I love “Pour moi toujours all right.” It’s my new favorite expression! Love your comments, Carol! Guess what, I searched for “Restaurant Monico” last night and found it immediately! I really don’t know how I missed it before. I thought I looked for it when I bought the postcard in February (from a dealer in Philadelphia). I’ll update the post today with the new information. And yes, “Pour moi toujours all right” sounds like a mantra to live by. The man with his hand on his chin cries out for a thought bubble above his head. Haha, very true! I’ve just enlarged the detail picture to include him. Maybe he’s René, thinking of his upcoming huitaine in London. I am intrigued by the hats, particularly the voluminous bonnet worn by the man in the front row. Also I like how the women’s hats perch on top of their coiffures. Yes, the chef’s hat is fabulous! His pose is confident, his expression stern. I would have been afraid to work in his kitchen. The woman behind him wasn’t intimidated by him, though. She placed her hand on his shoulder. 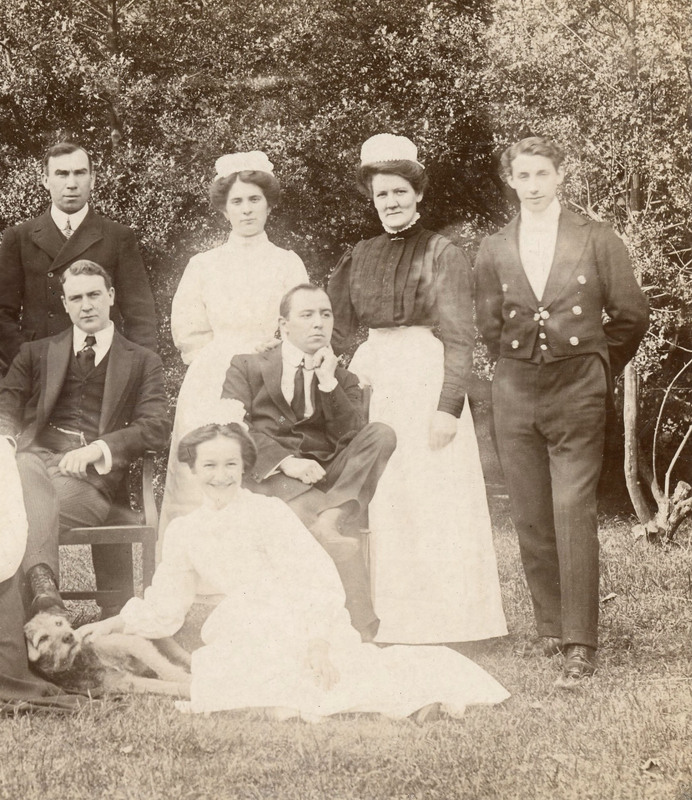 Wonderful image – I particularly like the beaming smile of the young lady seated on the front right of the photo! Thanks, Helena! Several people are smiling, which is nice, but her smile is truly joyful. I think she’s happy because she’s posing with the dog. Thank you for alerting me to this delightful photograph, of Lennel House when I think it must have been in its glory days. Such an interesting post. It’s a beautiful house, but not so much suited to a “retirement home”, with its big rooms and staircases. I know it from the inside as an relation of mine was there for some years. Thank you, Cara! I’ve added your name to the post, instead of referring to you as “a woman who lives in Coldstream.” I’ve also added a link at the end of the post to an article that you might find interesting. It’s about the connection between Lennel and the history of our understanding of shell shock, or PTSD. And then goes on ti invite his friend to see whether he is not a little ‘loc.’ whatever ‘loc’ means? In any case, marvellous visual cues your postcards provide into past lives. Thanks! Aha, I think you’ve solved a mystery! I was assuming “Je t’envoie” was referring to something else included in an envelope with this postcard, since the postcard wasn’t stamped. But your interpretation makes a lot of sense! Merci, Sarah! “Binette” for “face” and “clique” for “group” are terms of slang. Thanks so much! That was what Sarah thought, but it’s great to have confirmation. I’ll make a change to the post. The clique looks like an interesting group of people with a range of temperaments. I wish we knew which fellow was René! For the last part of the phrase, i read: “tu vois si je suis un peu là”?.